I'm Here. I'm Queer. What the Hell do I read? : Announcing... The First-Ever Kid Lit Drink Night - Los Angeles! Announcing... The First-Ever Kid Lit Drink Night - Los Angeles! Inspired by the Kid Lit Drink Night cooked up by author/blogger/librarian Betsy Bird and editor/author Cheryl Klein in New York City, Los Angeles whips up our own version of the drop-by-for-drinks-and-food (you buy your own) and great conversation with cool people in the Children's Literature Industry Evening! Aficionados passionate about creating creative content for children and teens! It's an event masterminded by myself, poet/author/blogger Greg Pincus, writer/photographer Rita Crayon Huang, debut author (whose amazing book "Harbinger" is coming out February of 2012) Sara Wilson Etienne and literary agent/poet Jill Corcoran! We hope you join us and further invite you to spread the word and invite your L.A.-based Kid Lit World friends. And if you're on facebook, you can let us know you're joining in the fun! Also, note that The SECOND Kid Lit Drink Night - Los Angeles! Will be held on Sunday August 7th in the same location, right after the day's events conclude across the street at the 40th anniversary SCBWI Summer Conference! (We're thinking it will be from 6-8pm as well.) By the way, have you registered yet? Today's the last day to get the early registration discount! So hopefully, if you're coming into town for #LA11SCBWI, you can join us locals for Kid Lit Drink Night-L.A. as well! p.s. 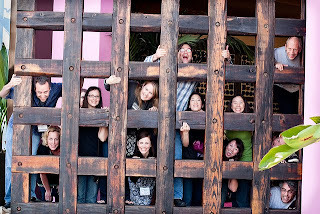 - the photo is by Rita Crayon Huang, and is of a group of kid lit folks at pink taco! 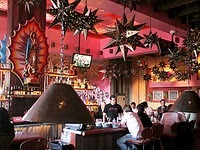 How big is this Pink Taco? There are a lot of us writer illustrator types. Lupe and Susan will probably be there. Hilde is out of town and Kris has baby sitting issues.